The annual As-Suffa bike ride challenge is back and this time it will take place just after the holidays! Get on your bike, Get fit and raise some cash for worthwhile causes on our doorstep! Ride 25, 50, or 75 miles through the country lanes of the Midlands, finish with a celebratory meal and receive your medal at our awards ceremony! Registration is required in order to reserve your place on this ride. Who is this ride for? Once you have registered please set up a JustGiving page to get your fundraising started. 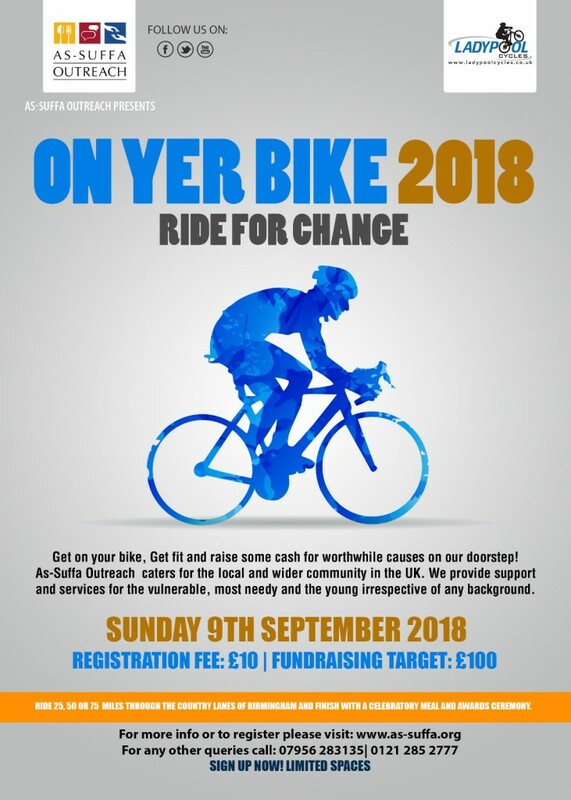 Start by clicking here: https://www.justgiving.com/teams/on-yer-bike-2018 and then click on ‘Join the team’ and then ‘Make a new fundraising page’. Note: The charity name is As-Suffa Trust (charity no: 1106270).